Three winners in one tournament? Yes, that happened at RunGood Kansas City this weekend! 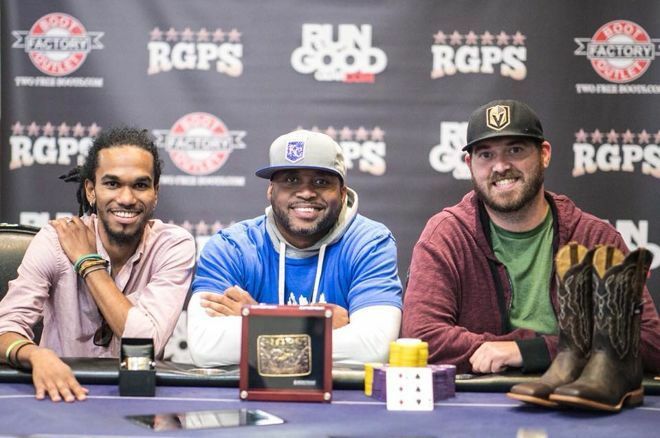 The RunGood Old West tour blew into Kansas City like a tumbleweed and brought our gamble with us. 2018 WSOP Main Event Champion John Cynn joined us for the preliminary events and 2017 WSOP Main Event Champion Scott Blumstein arrived in time for the Main Event, joining 390 other players for their shot at a $43,010 payday. Andrew Flaherty punched his ticket to Day 2 in the first flight, bagging up 83,500 over the course of Day 1A. Corey Blevins emerged from Day 1B with the overall chip lead, bringing 201,500 chips with him to start Day 2. Garnet Farron also advanced to Day 2 from Day 1B, bringing 71,500 chip to the final day of competition. At the end of the competition, we asked Farron what he planned to do tomorrow. Farron said he was supposed to work at 5 a.m. at Trader Joe's, but he might have to take the day off. Flaherty said he picked the right time to be unemployed--Flaherty spent the last month on a tour of the Pacific Northwest as a drummer in a band playing multiple gigs throughout the PNW region. Unfortunately, we weren't able to speak with Blevins about his plans. The biggest hand of the tournament for Garnet Farron was when his pocket tens spiked a set against Brandon Zallar's pocket aces and Michael Lech's ace-king in a three-way all-in, which saw Lech exit the tournament in 13th place. Farron later came from behind with ace-nine of hearts against his Matt Riffel's ace-king to send Riffel to the rail in 6th place. Flaherty's first pivotal hand was when his ace-queen of diamonds cracked Matt Donaldson's aces when 34 players were left. Donaldson survived to make the final table, but the hand kept Flaherty alive. A second key hand involved a rivered set against Doug Miller. And a third key hand came against 4th-place finisher Brandon Zallar. Flaherty knocked out Zallar during 4-handed play with ace-king of diamonds against Zallar's ace-queen offsuit, propelling Flaherty above 3 million chips. As for Blevins, we could only find one hand throughout the blog where Blevins went to showdown with a hand. We even went back through our notes of the hands that weren't written up--and the trend was practically universal. Blevins bets and his opponents fold. Winning hands without giving away information? That's some skill, right there. All good things must come to an end, and the settling of the payouts and awards in the RGPS Old West Main Event marks the end of our visit to Kansas City. RunGood would like to thank the staff at Harrah's North Kansas City for all their hard work during the series, to the ambassadors, to John Cynn and Scott Blumstein, and to all of the players for making this series great. We hope to see you again at our next destination: Horseshoe Bossier City, October 2-7.